As above but with q replacing bi and qj replacing bj . If g/b0 > 1,5(1 -/?) and g/b0 > t\ + t2 treat the joint as two separate T or Y joints. 2) The overlap may be increased to enable the toe of the overlapped brace to be welded to the chord. (1) In brace member connections subject only to axial forces, the design internal axial force 1iEd should not exceed the design axial resistance of the welded joint 1i,Rd , determined from 7.5.2.1(2) or 7.5.2.1(4) as appropriate. 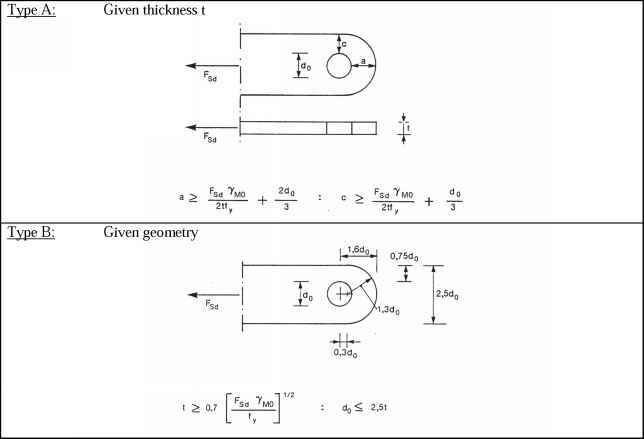 (2) For welded joints between square or circular hollow section brace members and square hollow section chord members only, where the geometry of the joints is within the range of validity given in Table 7.8 and also satisfies the additional conditions given in Table 7.9, the design axial resistances may be determined from the expressions given in Table 7.10. (3) For joints within the range of validity of Table 7.9, the only design criteria that need be considered are chord face failure and brace failure with reduced effective width. The design axial resistance should be taken as the minimum value for these two criteria. NOTE: The design axial resistances for joints of hollow section brace members to square hollow section chords given in Table 7.10 have been simplified by omitting design criteria that are never critical within the range of validity of Table 7.9. (4) The design axial resistances of any unreinforced welded joint between CHS or RHS brace members and RHS chords, within the range of validity of Table 7.8, may be determined using the expressions given in Table 7.11, Table 7.12 or Table 7.13 as appropriate. For reinforced joints see 7.5.2.2.